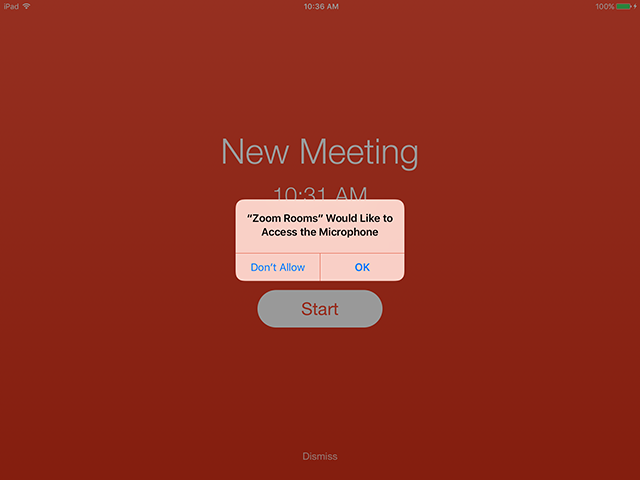 You can start a scheduled meeting in a Zoom Room by saying "Hey Zoom, start meeting". The voice command is activated within 10 minutes, before or after, the scheduled meeting time and when there is no currently meeting in session. It only starts scheduled meetings, not instant meetings. Sign into the Zoom account as a Zoom Rooms administrator and navigate to the Zoom Rooms tab. Click the level in the hierarchy that you want to enable for Voice Commands. For example, to enable all rooms in a specific building, click the name of the building, or click Edit for a specific Zoom Room to enable it in an individual Zoom Room. Go to Meeting Settings and enable the option for Upcoming meeting Alert. Enable the option for Voice Commands. For a scheduled meeting, you will see the meeting listed on the controller tablet and on the TV. 10 minutes before your first meeting with voice commands enabled, the iPad will prompt you for permission to use Voice Commands. 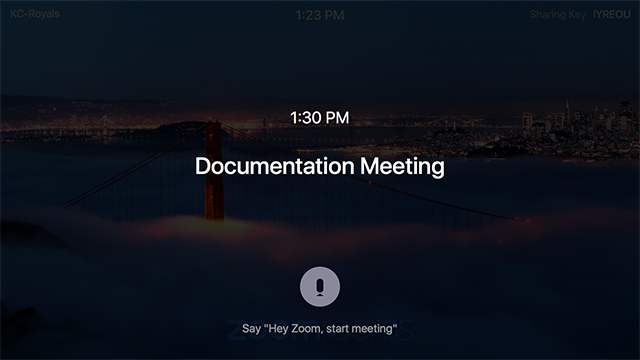 Once Zoom has access to the microphone, say "Hey Zoom, start meeting" to start the scheduled meeting. If you have previously denied Zoom access to the microphone on the iPad, you will need to manually allow access before using voice commands. Toggle Zoom Rooms to On.